This self-guided walking tour takes you to the major sites of interest in Dijon. Dijon has adopted the owl (chouette) as a symbol for the city and uses it to promote its tourism. The original owl is carved on the side of the Église Notre-Dame. Local tradition says if you rub the owl with your left hand and make a wish, your wish will come true. The city's walking tour, The Owl's Trail (le parcours de la chouette) uses the owl as its symbol and to mark the trail. The owls are seen on brass plaques in the sidewalks and streets, symbols that provide a guide for your walking tour. 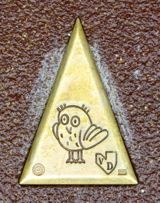 At each site there is a larger owl plaque with a number that is keyed to the trail, and often a description of the site. You can buy a guide to the Owl's Trail at the Tourist Information Office for 3,5€. This booklet (which comes in several languages) provides brief explanations of the 22 stops along the trail, as well as three additional "loops" to areas outside of the center. The guide also includes some special points of interest for families traveling with children. And kids enjoy finding the owls along the way. Although the Owl's Trail officially starts at the Place D'Arcy (map), you can pick it up anywhere along the way and just visit whichever sites are of most interest to you. There's an annotated map in the center to help you find your way. 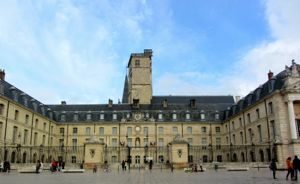 Some of the major sites include the Palais des Ducs de Bourgogne and the Musée des Beaux Arts, several different churches of Dijon, the Halles or Market, and a variety of museums. Above, The Palais des Ducs de Bourgogne and the Tower of Philippe Le Bon, both stops on the Owl's Trail.